Easter is a fun holiday that is all about candy and color. It’s also about a variety of religious traditions, but even those who don’t participate in the religious aspect of the holiday can appreciate the uniquely seasonal candies that are also Easter traditions, such as bright yellow Peeps marshmallow chicks and fondant-filled Cadbury creme eggs. 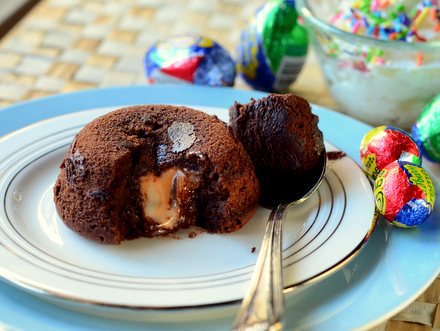 These Cadbury Egg Chocolate Lava Cakes combine these rich Easter eggs with luscious molten chocolate cake for a dessert that is a lot of fun to make and to eat! 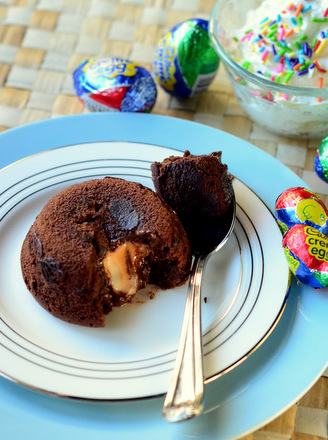 The individual cakes are made with a simple batter and a miniature Cadbury creme egg is pressed into the center of each cake. Mini eggs are just the right size for these cakes, so save the large creme eggs for another occasion. The cake bakes around the egg, which melds into the molten center of the cake, leaving you with a pool of rich chocolate and creme egg filling in the center that will ooze out when you dig a fork or spoon in for a bite. The cake is rich and chocolaty, as a good lava cake should be. The cake itself is made with dark chocolate and has relatively little sugar, so it isn’t very sweet even with the sweet creme egg center. I enjoy the cakes as-is, but they are also delicious when served alongside a little bit of whipped cream or even a scoop of ice cream. The cakes are best eaten right away, as the fondant centers of the creme eggs will eventually firm up as the cakes cool. 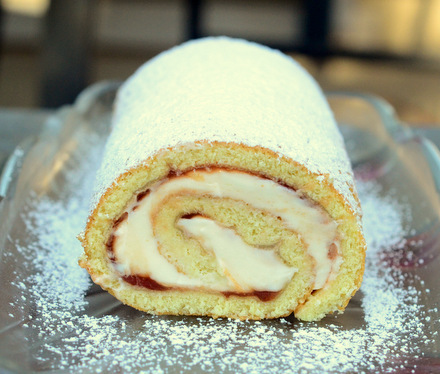 The cakes can be reheated in the microwave if you have leftovers, but they are definitely at their best when fresh. This recipe only makes a small batch of cakes, so it shouldn’t be hard to eat them all with a few friends or family members in one evening. The cakes need to be baked just before serving, however, the batter can actually be prepared a bit ahead of time and the filled ramekins can sit out at room temperature while you eat dinner (for instance) and popped in the oven when you are ready for dessert. Any fan of creme eggs will get a huge kick out of these delicious little cakes – and they just might become a new Easter tradition for you! Preheat oven to 400F. Butter four 8-oz ramekins and dust each well with cocoa powder. In a small bowl, melt together 4-oz chocolate and the butter. Set aside to cool slightly for 2-3 minutes. In a large bowl, combine the eggs, sugar, vanilla and salt. Beat with an electric mixer until the mixture triples in volume and is very thick (about 5-7 minutes). Add cooled chocolate/butter mixture and fold in until the chocolate is completely incorporated. Sift flour over the rest of the batter and fold until until batter is uniform. Pour into prepared ramekins. Unwrap mini Cadbury eggs and place on in the center of each ramekin. Eggs should be completely, or almost completely, covered with batter. Bake for 10-11 minutes, or until the tops are set. Let cakes cool in the ramekins for 5 minutes, then run a knife around the edge of the cakes and invert onto individual plates. 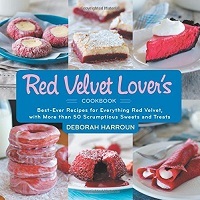 Serve immediately, with lightly sweetened whipped cream or vanilla ice cream, if desired.